Ectopic pregnancies cause more pregnancy-related deaths than any other pregnancy complication. Doctors and researchers have been looking for a means of determining women who are at increased risk to help reduce the number of deaths associated with the condition each year. New research appears to have solved that problem. 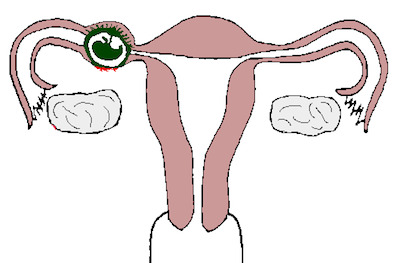 Researchers have connected the hormone adrenomedullin to ectopic pregnancies. The results of the study were published in the Journal of Clinical Endocrinology & Metabolism. An ectopic pregnancy occurs when a fertilized egg implants in the fallopian tube instead of the uterus. The fallopian tube is equipped to move the fertilized egg to the uterus, not provide a healthy environment for the fertilized egg. The tube is so small and narrow that the growing fetus soon starts pressing on the walls of the tube and eventually the tube bursts, causing an immediate health threat that may lead to death if left untreated. Researchers now believe that the small hairs that push the fertilized egg toward the uterus may be to blame for some ectopic pregnancies. If the hairs, called cilia, are not working properly the egg is not moved to the uterus and implantation occurs early, in the fallopian tube. The hormone that may be responsible for cilia movement is adrenomedullin (ADM). When women who’d suffered an ectopic pregnancy were tested for ADM levels, the levels were significantly lower than expected. This could mean the cilia were unable to move effectively causing the improper implantation. This could mean testing for ADM levels could predict possibility of ectopic pregnancy in high risk women. It could also mean that treatments for ectopic pregnancy could be on the horizon so women with a history of ectopic pregnancy are less likely to suffer the same condition a second time. Source: SB Laio, HWR Li, JC Ho, WSB Yeung, EHY Ng, ANY Cheung, F Tang of the University of Hong Kong. The Journal of Clinical Endocrinology & Metabolism. June 2012 Issue.